Now the film I’m discussing today has nothing in common with the above except traveling a fairly similar process on the road to the goal of artistic and financial success. So, imagine sitting in a room filled with producers, investors, teams deciding the absolutely perfect way to present your celluloid jewel to the public… and then it happens… that something or someone that has the possibility to derail all of your cinematic train’s success. Sometimes (unlike W.W.) there isn’t time or money for reshoots, so it’s off to the editing room, to re-cut, re-shape and re-enforce what you’ve already got. But what if the star is too big, or the creators feel the sequence is crucial to the narrative, so simple elimination as a worst possible scenario fix gives creators and studios a sense of increasing wrongheadedness to the “isn’t it a possibility” decision. In the case of the efficient, extremely effective 2014 horror thriller DARK WAS THE NIGHT, (fairly generic title, sounds like a purple prose romance novel) it seems, unfortunately, the idea was to count on the imaginative (up to a VERY important point) narrative, solid direction and the creative team’s commitment and highly polished result to convince/seduce/beg the audience for a moment (literally folks – A MOMENT) of indulgement for such a derivative contrivance, that I felt I had been cinematically sucker punched – the surprise, disappointment, anger, frustration and yes, in a way humiliation, because the level of entertainment, enjoyment and respect I had for the project was growing to a surprisingly high level. Yeppers, some folks who say, “chill out dude, it’s just a horror movie,” may have their point. Being, as I’ve shared with you before, a fan who keeps himself as open and non-pre-judgmental, willing to “take the ride” and fully suspend my disbelief (obviously, as this discussion points out, to a CERTAIN POINT) when a piece of cinema is effectively, “firing on all cylinders” and has me exactly where it wants me to be and suddenly hits an ugly non-creative, ineffective, majorly disappointing wall (I know, YIKES! Daniel, tell us how you REALLY feel) it really bothers me… A LOT. First of all, not seeing in its synopsis the words Zombie Apocalypse, Knife Wielding Maniac, 4 Teenagers, Remote Cabin or Ghost Seeking Revenge made me so very happy and excited. Much the same way I did for Brian Bertano’s MONSTER, I did a little wheelchair dance at the prospect of seeing a good ole’ fashioned CREATURE FEATURE!! After a series of (yes once again we shake hands with tropes that prompted the dude sitting next to me to fold his arms throw his head back and mutter “here we go again”) opening establishing shots of a heavily congested forest (and yes if I only had a dollar for each…) we cut to a series of shots (Ryan Samul) in rapid succession (Paul Covington, Neil Donovan Toby Yates). An establishing shot panning down into trees? Absolutely a lead-in, often used in the opening of SO many genre films? I’ll give you that one, kinda/sorta, these shots were interestingly gaining momentum with editorial choices that emphasized the brutal chopping, clipping, cutting and grinding involved in “clearing” a natural space for architectural “progress” with a final shot of collected, chained together tree trunks, visually similar to corpses in a horror flick… nice stuff courtesy of Director Jack Heller. We are introduced to a small town on the edge of a forest (trees as moody and foreboding as anything in THE VVITCH or BLAIR WITCH – they look like bars in a prison cell). Time and time again the team of Samul and Heller find atmospheric, tension building visuals with wonderfully effective use of light or something caught just out of frame. The town Maiden Woods (get it?) is just south of the logging site and workers that we see savagely attacked and killed by… something (just as Spielberg was forced to due in JAWS, but in this instance by budget limitations Heller gives us the monster in bits and pieces, sometimes using a POV camera to represent the beast). Whether by necessity or not, this amps up viewer anxiety and tension as the small town is besieged by farm animals being stolen, or eaten, or both. 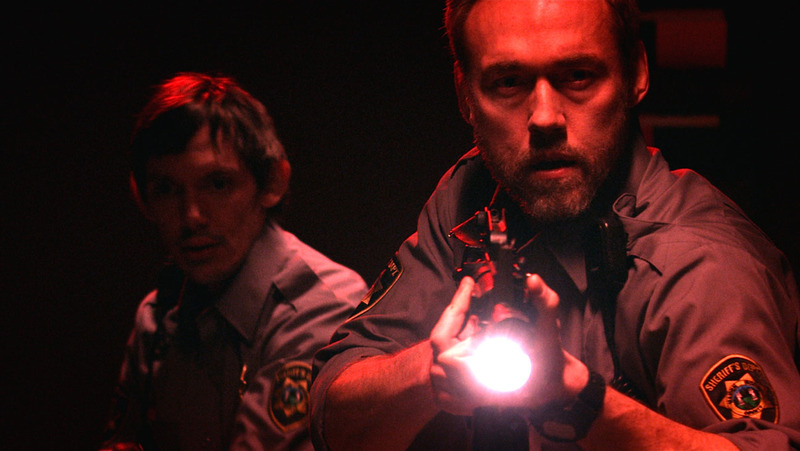 It is here that we meet the film’s reluctant hero, Sheriff Paul Shields – a truly fantastic, multi layered performance by Canadian Kevin Durand. The challenges faced by this character and therefore this actor could have been over the top or annoyingly histrionic in lesser hands. Durand brings a depth of sorrow and vulnerability that keeps us rooting for him to face two horrors, whatever is in the woods and a solid subplot of guilt for the accidental death of one of his two sons. He has isolated himself from his wife Diana (a very good Bianca Kajelich) and other adoring son, Andy (talented and “real” as he is cute Ethan Kudsiman). The supporting cast are stronger than one might expect from a low budget independently made creature feature. One other shining example of solid acting is Lukas Haas as Deputy Danny Saunders. Although, unfortunately he never did grow into those ears (WITNESS anyone?) he did however grow into a fine actor who holds his own in his many scenes with the powerhouse performance by Durand – who now that I think about it, has more than a passing resemblance to Brit actor Hugh Laurie (House anyone?). We’re heading ever closer to the event that took this very solid, well-crafted event that even though it was only a MOMENT, cost this film a solid “star” on the ratings score board – Yeppers a solid star. Tyler Niesel’s script has its strengths and weaknesses, but it gives Heller and company (especially Durand) a concept with enough fresh ideas as a “jumping off” point. Darren Morze’s score was actually quite effective, especially when director Heller (who knows a thing or two about building tension, both in a forest with only a flashlight as a friend – but even more so in claustrophobic, vulnerable inescapable spaces.